Nokia has introduced the latest in their E-series range – the Nokia E71 and Nokia E66. Both E71 and E66 support the Nokia Intellisync Wireless Email solution as well as third party email solutions like System Seven and Visto Mobile. Both devices come with the new switch mode that allows people easily to switch between personal and work home screens. 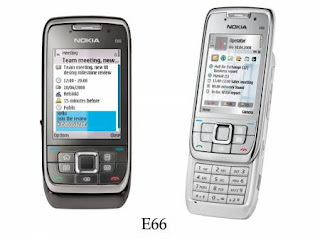 Nokia E66: The successor to the Nokia E65, the E66 continues to offer a cool slider phone design, but it’s been trimmed down and comes in gray or white with steel accents. This Nokia smartphone also has “turn-to-full view,” which is similar to the iPhone’s accelerometer feature in that when you turn the device on its side, the screen orientation will automatically switch from portrait to landscape mode. You can also alternate between Business and Personal mode. In Business mode, you’ll have all your productivity tools readily accessible on your home screen, such as e-mail, calendar, and documents. Meanwhile, when you switch to Personal view, you’ll get access to your multimedia files, the Web, and so forth. The Nokia E66 will continue to run the third edition of the S60 platform on the Symbian operating system and has integrated Wi-Fi and Bluetooth 2.0 (with A2DP support). Plus, it now offers assisted GPS and U.S. 3G support (850/1900; HSDPA). Other goodies include a 3.2-megapixel camera, support for Nokia’s Ovi Internet service, 110MB internal memory plus microSD slot (supports up to 8GB cards), and a 2.4-inch QVGA nontouch display. 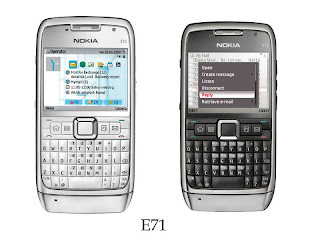 Nokia E71: The E71 represents the more dramatic design makeover of the two. Taking over for the Nokia E61i, the E71 is still very much a messaging-centric device with its full QWERTY keyboard but it’s not as bulky or dull-looking anymore. The smartphone measures 4.4 inches tall by 2.2 inches wide by 0.4 inch deep and weighs 4.4 ounces, compared with the E61i’s dimensions of 4.6 inches tall by 2.7 inches wide by 0.5 inch deep and 5.3 ounces. The E71 will also come in gray or white, and have a 2.36-inch, 16 million-color QVGA display. 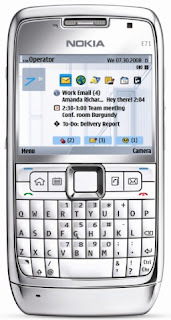 Feature wise, the Symbian smartphone supports Mail for Exchange, POP/IMAP accounts, and works with a number of push e-mail solutions, including Intellisync Wireless E-mail, Visto, and Seven Always-On Mail. The E71 will also have integrated Wi-Fi, Bluetooth 2.0, HSDPA, assisted GPS, and the Business and Personal home screens. The E71 comes in a stainless steel case, with etched graphics and will be available in two colors – grey steel or white steel. The Nokia E66 too comes in a stainless steel shell and shares the same key features as the Nokia E71, including an enhanced calendar, contacts and customizable home screen modes.